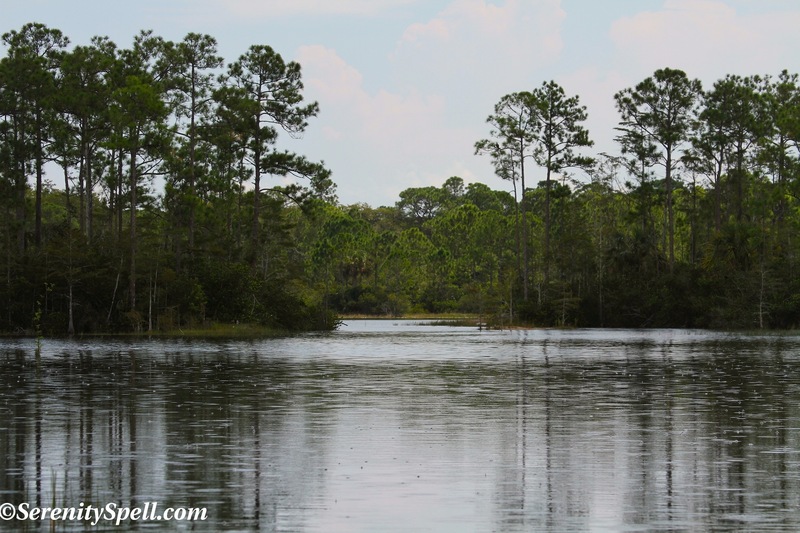 The last time we visited Cypress Creek Natural Area, we were thrilled to explore part of its 2000 acres of newly restored sensitive pine forest and wetland habitats. 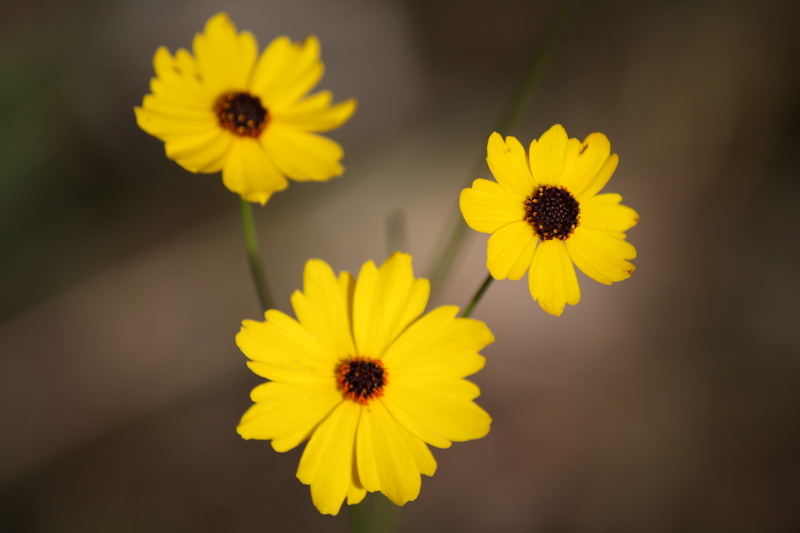 We were even more ecstatic to learn of the county’s continued aggressive preservation and restoration efforts of the area. 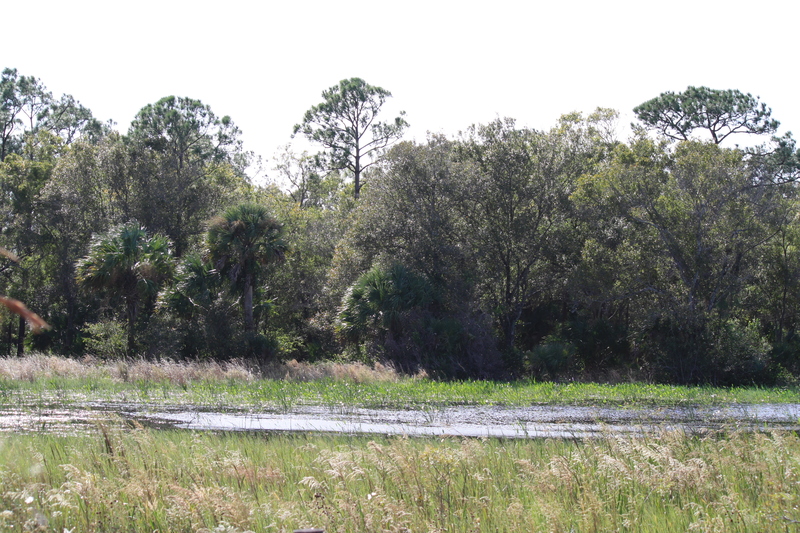 Part of the Northeast Everglades Natural Area (or NENA, which holds approximately 165,000 acres of conservation land in northern Palm Beach Country and southern Martin County), and serving as a buffer for the Loxahatchee Wild and Scenic River, Cypress Creek is a valuable part of the Everglades ecosystem. 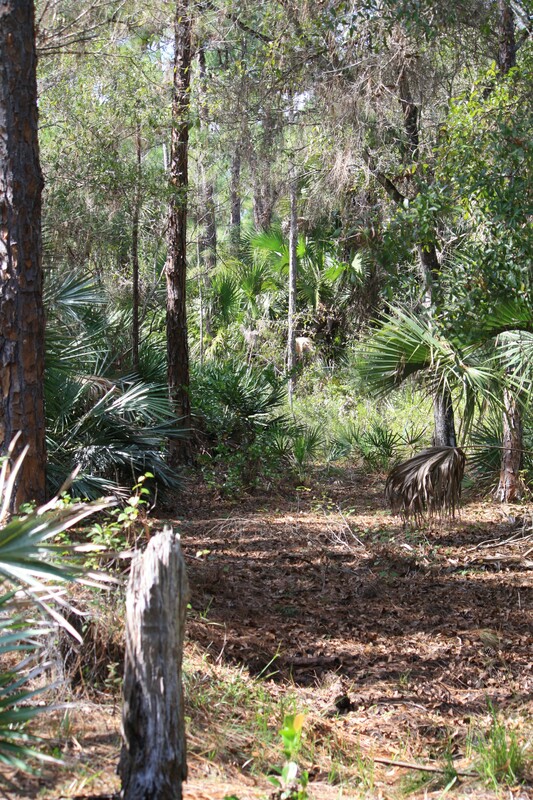 Managed by Palm Beach County, current restoration activities in Cypress Creek include the removal of invasive non-native vegetation, filling miles of ditches (we continue to witness these efforts), changing the elevations of shell mining pits to encourage re-vegetation of native plants, and improving the Old Indiantown Road grade — now known as the Historic Jupiter-Indiantown Trail — for use as a multi-use trail. 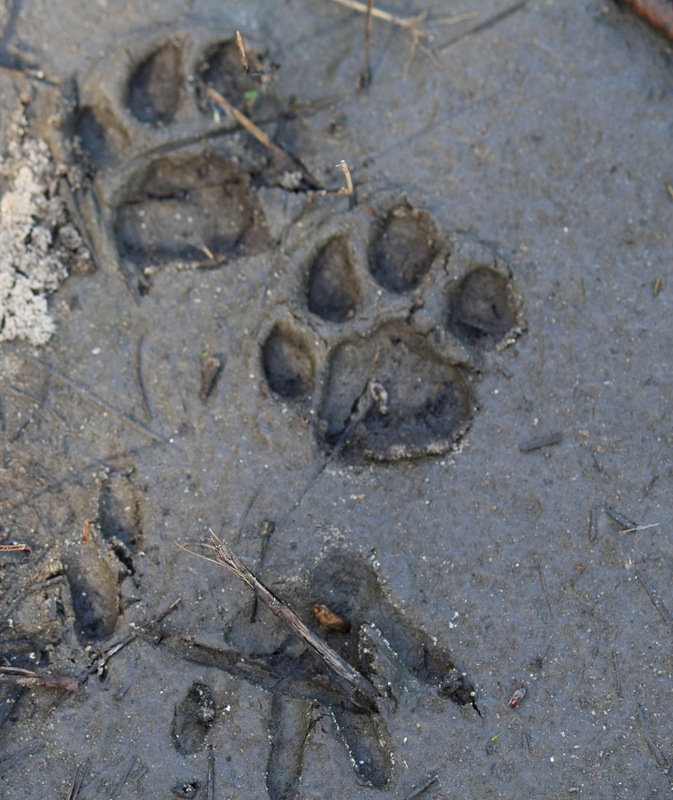 We recently hiked a different section of Cypress Creek, and saw loads of animal tracks due to the fact that not many humans probably make it out to where we ventured — deer, coyote, bobcat, wild boar. 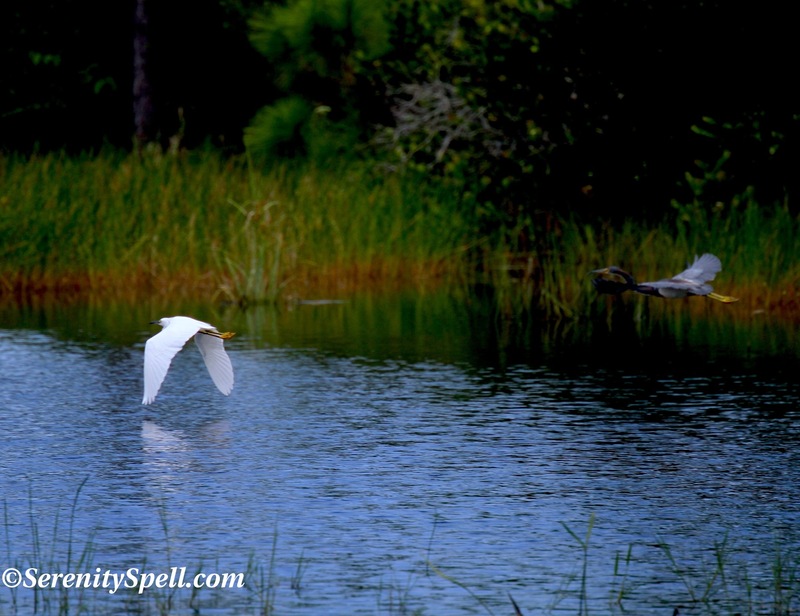 It was a wonderful sight to see, and I hope that the county continues it preservation efforts to protect this critical and threatened habitat, returning it to its full splendor…and providing a home for the wildlife once again. 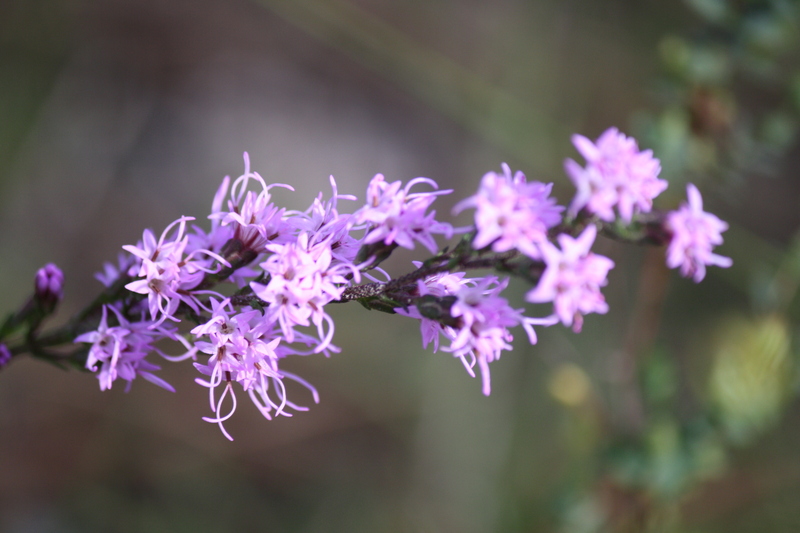 It’s wonderful to witness! 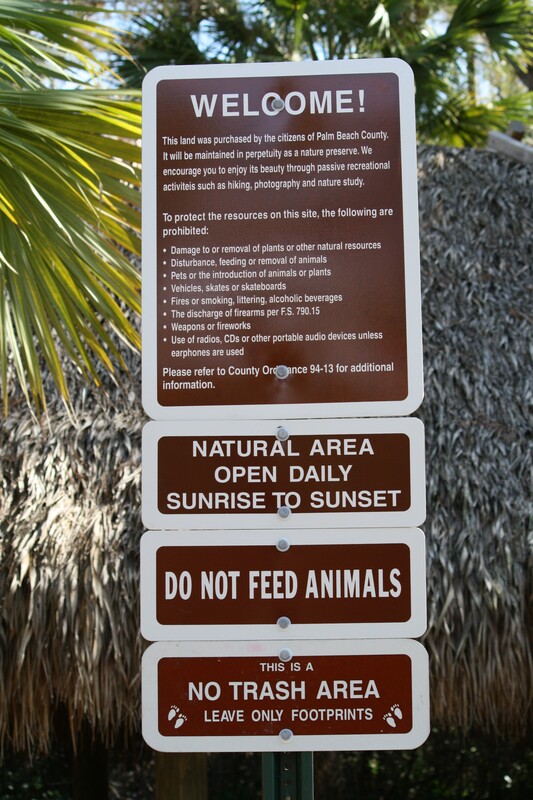 Gator check… Good to go. OK for foto session. 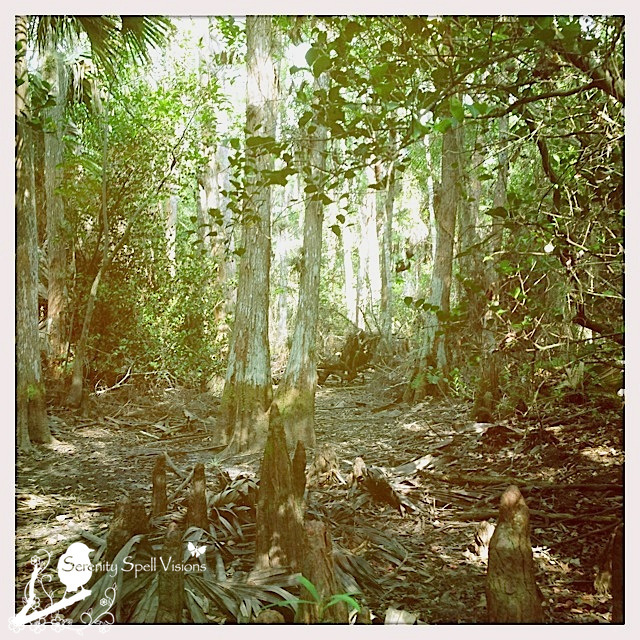 We’re always looking for new areas to hike in South Florida, so we were VERY excited to stumble across this newly-created natural area as we were heading towards the Florida Trail in Jupiter (across from Riverbend Park). 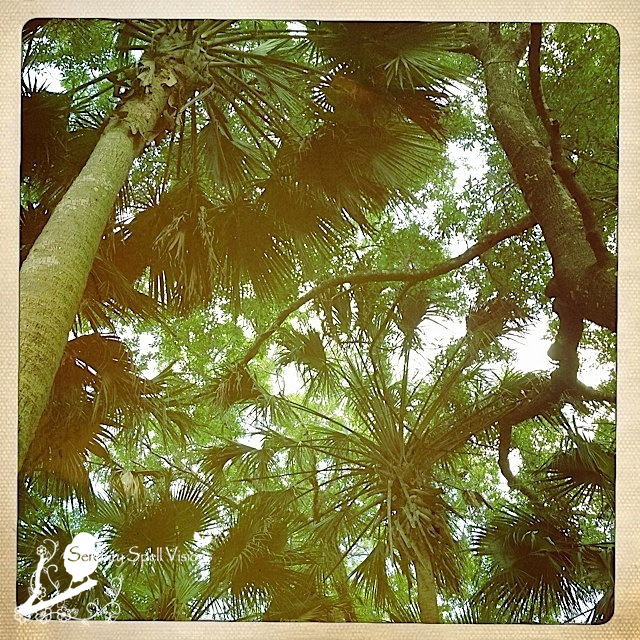 Besides which, we’re always thrilled when South Florida actively preserves its pristine lands! 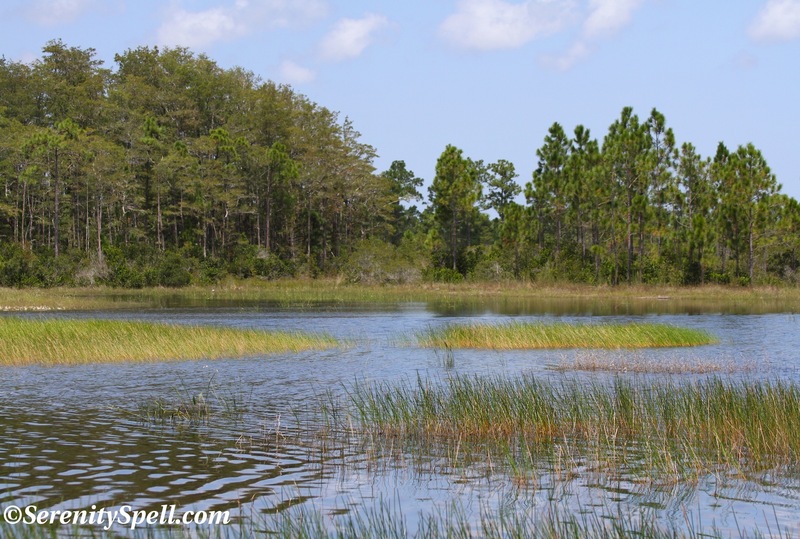 The Cypress Creek Natural Area protects sensitive pine forest and wetland habitats. Hoorah! 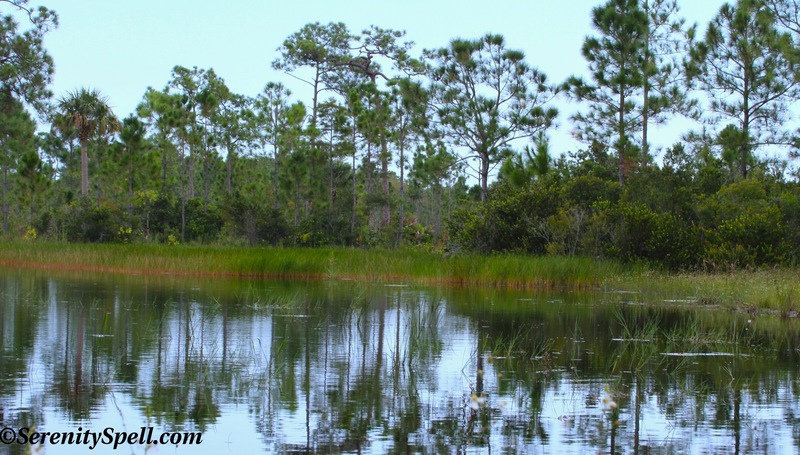 These lands in the Cypress Creek Natural Area — more than 2,000 acres in total — were acquired by Palm Beach County from 1995 to 2010, and are part of the Northeast Everglades Natural Area (NENA), serving as a buffer for the Loxahatchee Wild and Scenic River. 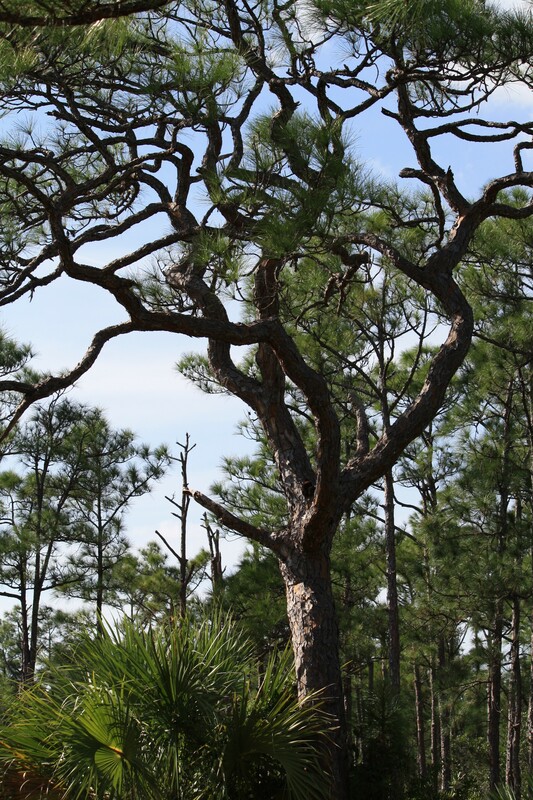 NENA holds approximately 165,000 acres of conservation land in northern Palm Beach Country and southern Martin County. 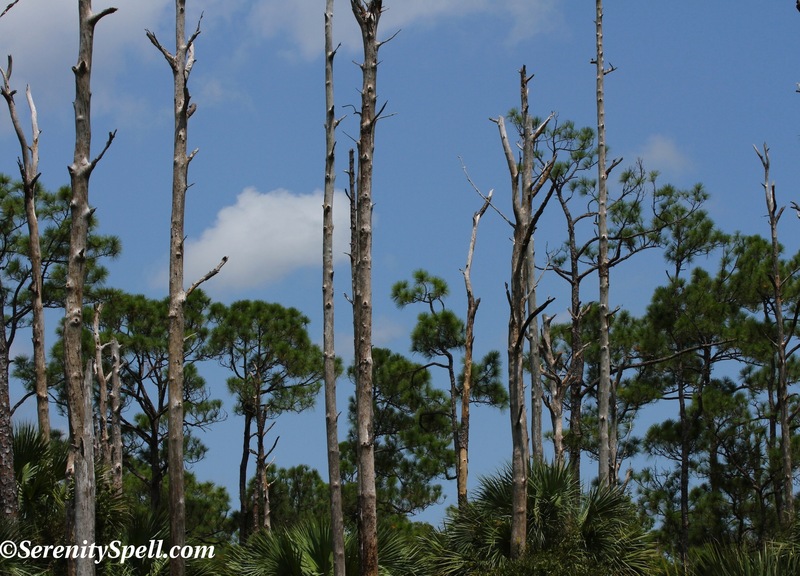 Managed by Palm Beach County, current restoration activities in Cypress Creek include the removal of invasive non-native vegetation, filling miles of ditches (we saw the dump/sand trucks to attest to that feat), changing the elevations of shell mining pits to encourage re-vegetation of native plants, and improving the Old Indiantown Road grade — now known as the Historic Jupiter-Indiantown Trail — for use as a multi-use trail. Work also continues on the 6-mile multi-use Jesup Trail, which will eventually lead into Jonathan Dickinson State Park — VERY exciting. 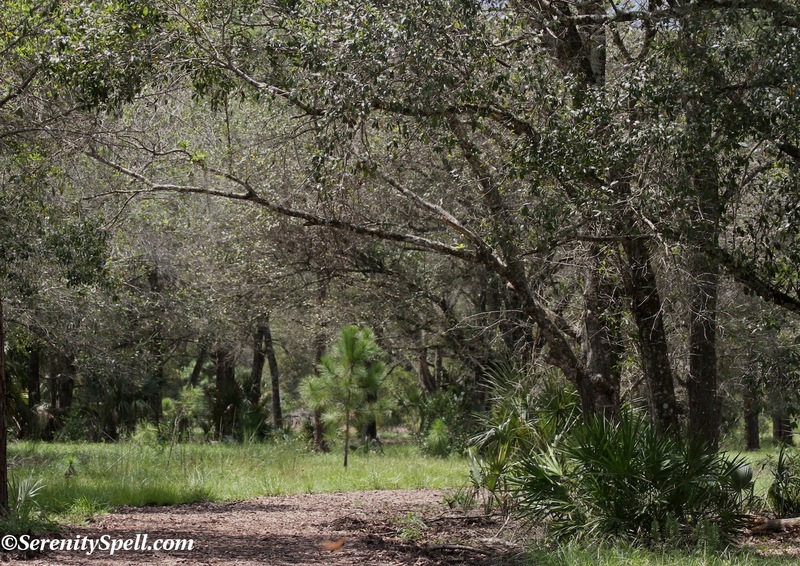 We investigated the Historic Jupiter-Indiantown Trail, a 16.5-multi-use trail. 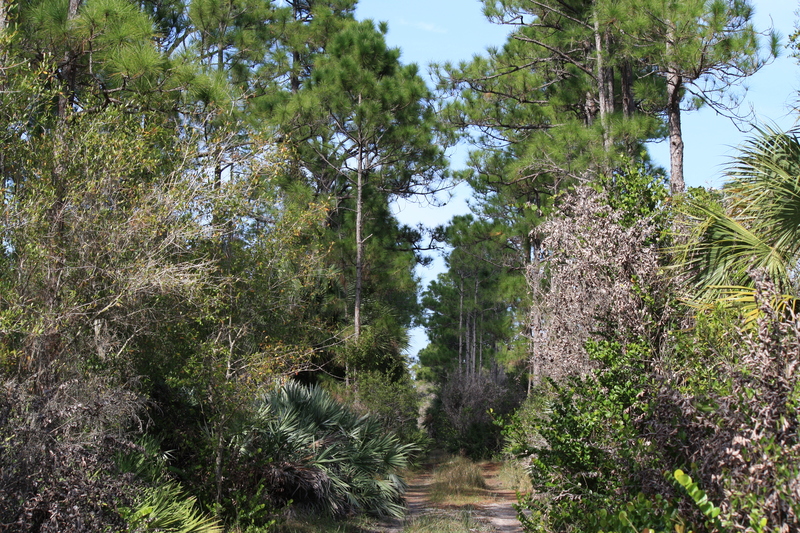 The trail is being built in phases, along a road that was used from 1900 into the late 1950s for travel between Jupiter and Indiantown. 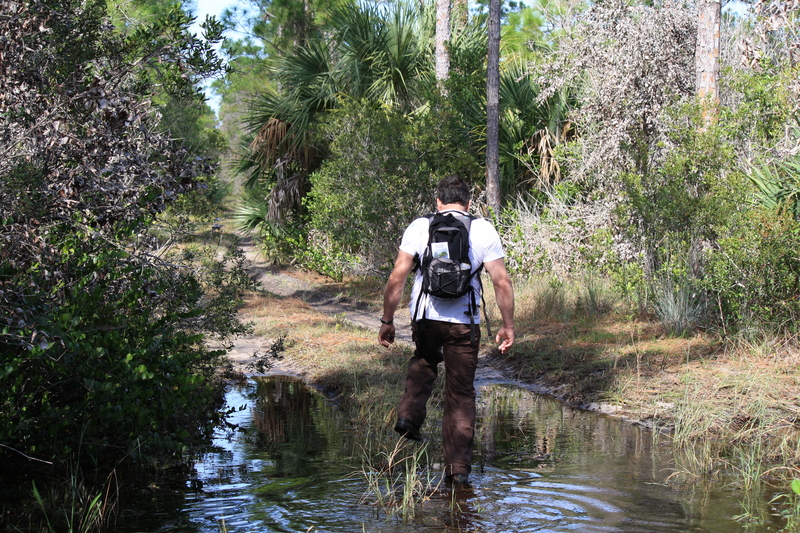 We pursued the hiking-only portion, a very nice, natural backcountry Florida hike, once you really got out there. 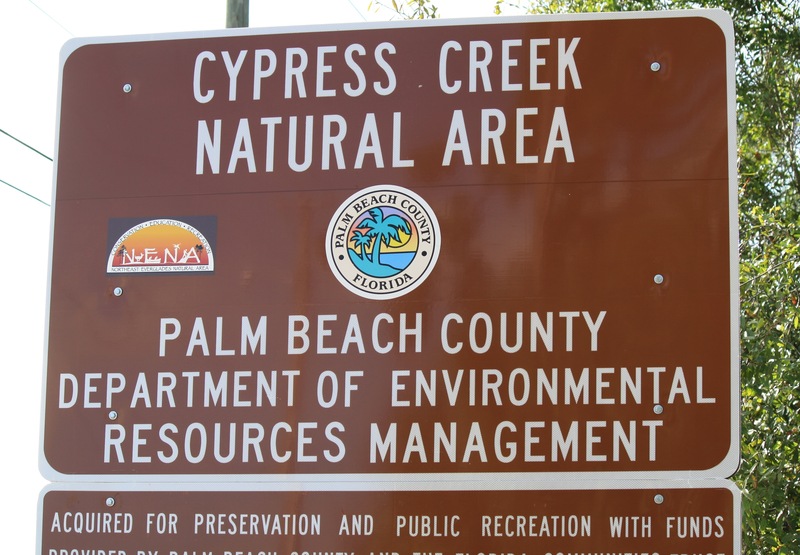 It offers access into three conservation lands and facilities, each of which is subjected to its own rules: Riverbend Park, Cypress Creek Natural Area, and Jones Hungryland Wildlife and Environmental Area. 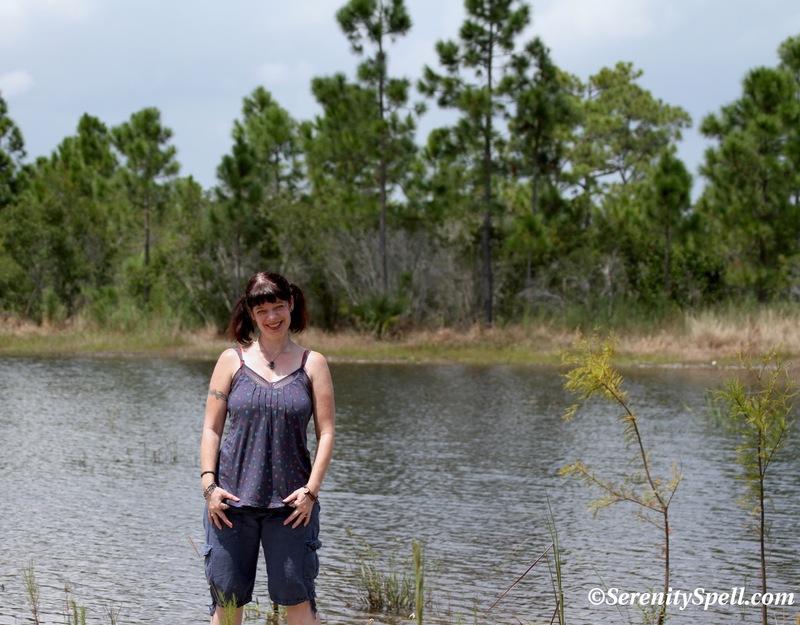 On this trail, it was important to have snacks and water (we were out there for several hours, but you can easily make it as short a trip as you wish). 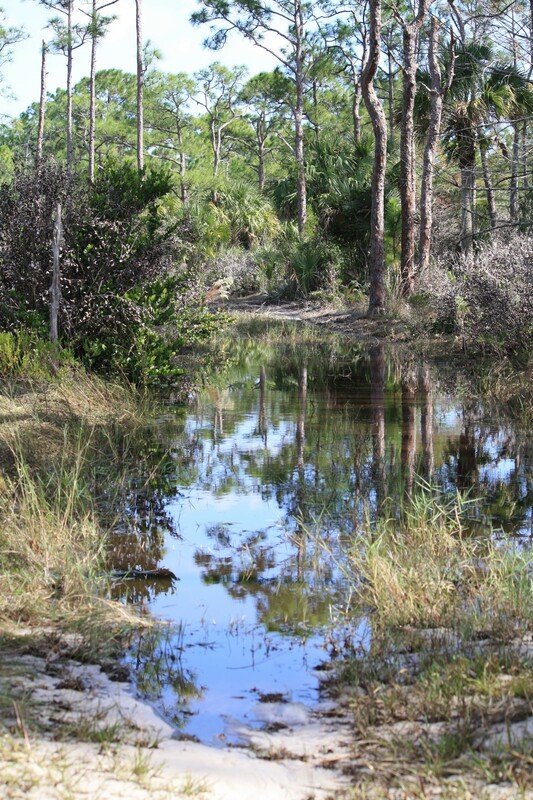 Portions of the trail were flooded, due to earlier rains, but they weren’t impassable. 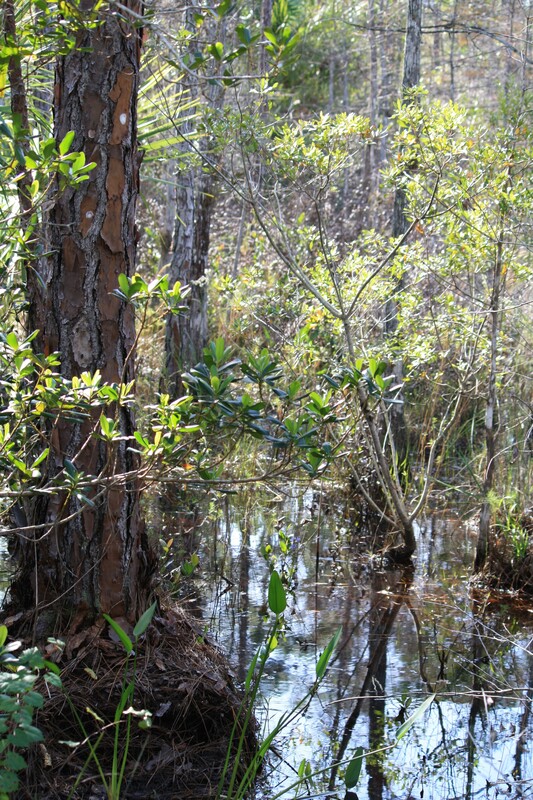 We wandered through native Florida ecosystems including wetlands, flatwoods, marsh, swamp, and prairie. 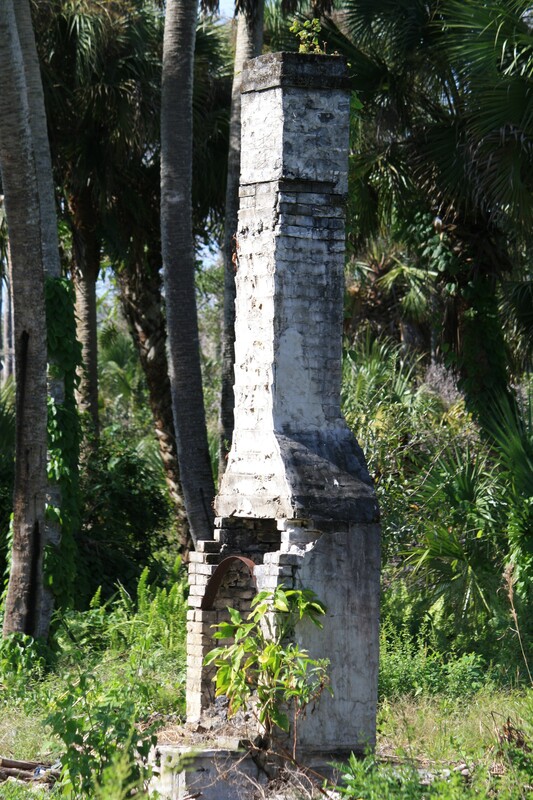 Early in the hike, a lonely chimney stands sentinel — most likely a remnant from one of Jupiter’s founding families (documentation doesn’t explain). 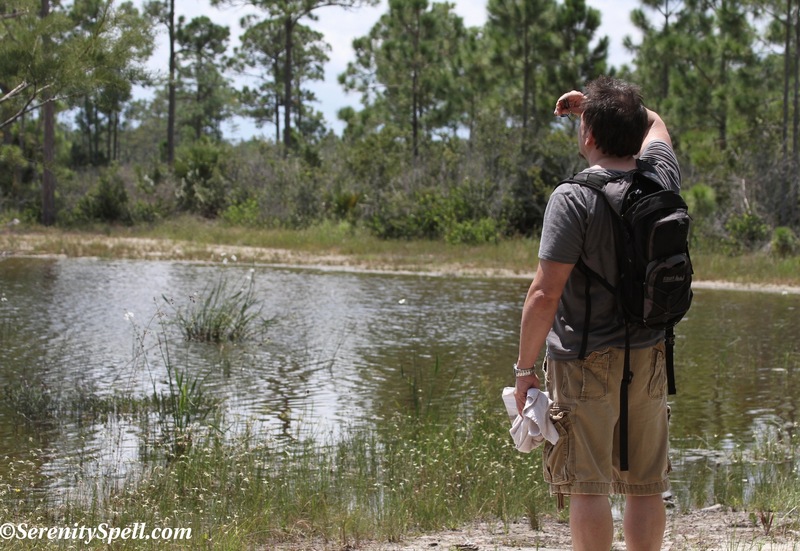 There weren’t many critters making themselves seen on our initial hiking expedition, despite us being the only 2-legged ones out there — but we did see many butterflies (Fritillary, Swallowtail), birds, a very startled and quick gopher tortoise, and abundant TRACKS! Very fresh tracks at that, all around us. 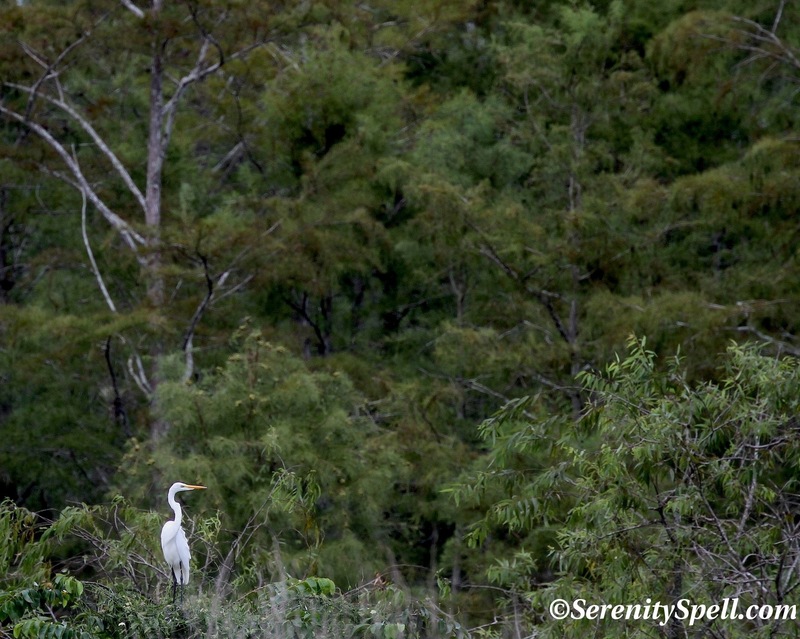 One large grouping we spotted as bobcat … but the other? 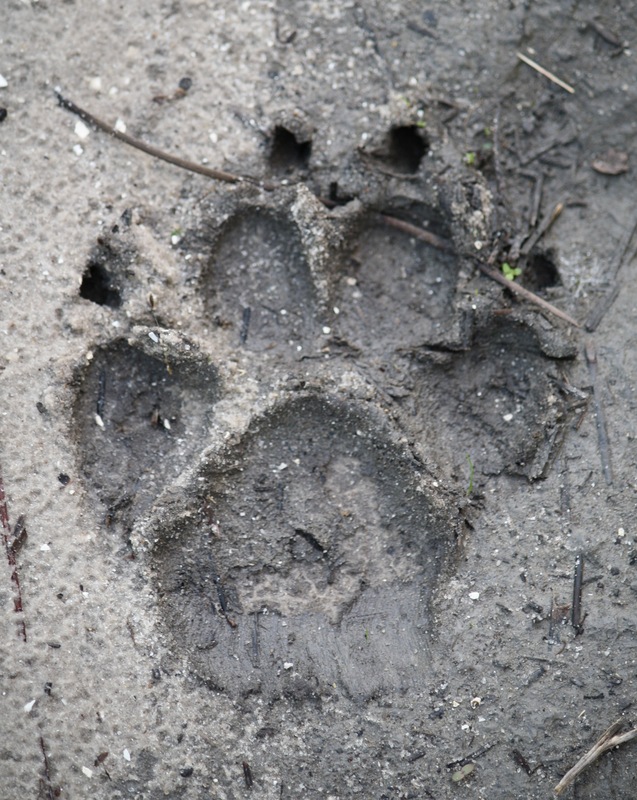 At first we thought it was coyote, but it was far too large — easily 4″. Also very fresh! PANTHER?!? Oh, how I hope they continue to watch and protect this area exceptionally *CAREFULLY* if this is indeed the case.